My upcoming exhibit is a photographic exploration of an extraordinary architectural and historical artifact. My upcoming book, also titled “Asyum” will present an expanded selection of images. In viewing the images in the gallery or in the book, I felt some historical context would be useful. The following is from the book’s introduction. Up to the early part of the nineteenth century, little was known about mental illness and as a result, the treatment of mentally ill people was generally barbaric. Different types of mental illness were generally lumped together as being “insane.” Insanity was often attributed to some moral failing or even the work of the devil. Because insane people were often disruptive, threatening, or at the very least exhibited behavior that was strange, they were isolated as much as possible from the community at large. Many “lunatics” were placed in jails or almshouses and kept in horrific conditions. Often they were chained to the wall in cold, damp basements. If they were fortunate to have some family to look after them, they were still often hidden away in attics or cellars so as not to be an embarrassment to the family. Things began to change in the 1840s, partially as a result of the efforts of Dorothea Dix, a New England schoolteacher. Dix travelled widely to expose the plight of the insane and convince state governments to fund asylums for the mentally ill. Her first success was the establishment of the New Jersey State Lunatic Asylum in 1848. Drawn and engraved by J.J. Pease from a daguerreotype by J.X. Mason. In the mid-nineteenth century, the dominant school of thought was that the insane could be cured by being treated in specially designed buildings. It was believed that the architecture of the building itself would have a curative effect. It was also thought that insanity could be caused by the stresses of modern life so locating these asylums in beautiful rural environments and away from the cities and commercial/industrial centers added to the overall curative benefit. 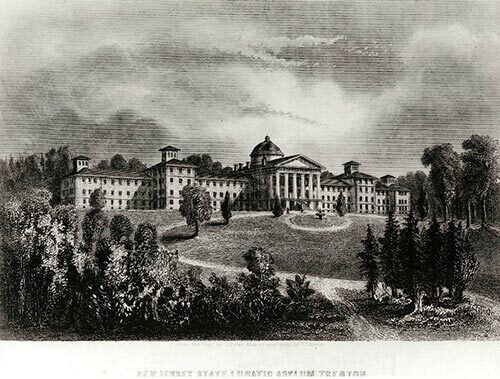 The New Jersey asylum followed a plan developed by psychiatrist Thomas Storey Kirkbride. 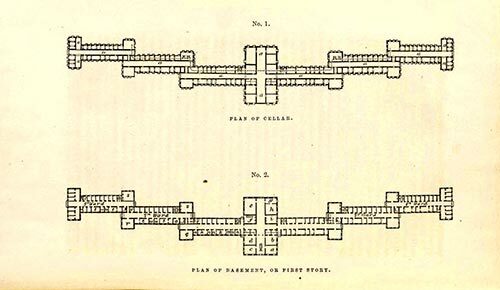 In the United States in the mid-nineteenth century, the Kirkbride plan was considered the most advanced approach to medical architecture in general and the treatment of the mentally ill in particular. The basic design featured pavilions that were connected and arranged in a shallow V in order to maximize the sunlight and fresh air for the patients. General Arrangements of Hospitals for the Insane,” Philadelphia, 1854. p. 40. Ultimately the Kirkbride plan was used in the design of dozens of asylums in the United States. The overall treatment of the patients was greatly improved over early nineteenth century standards, but some of the treatments today would still be considered barbaric. The “ice-pick lobotomy” stands out as being particularly horrific. Still, the development of these asylums at least represents an acknowledgement that mentally ill people deserved some effort by a trained medical community to understand and treat mental illness. A fascinating and detailed historical discussion of the history of architecture in the treatment of the mentally ill is The Architecture of Madness: Insane Asylums in the United States by historian Carla Yanni. 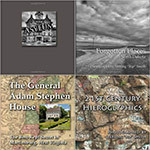 Paper bound hard copy and Kindle versions are available from Amazon.com. ~ by Admin2 on September 9, 2012.